Thanks to the flexbox, all is alligned perfectly. Ok, this is looking cool, but we still haven’t got our infinate honeycomb look. 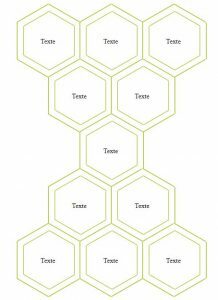 And we are not going to copy /paste hundreds of hex elements in our html code. Time for some jquery magic. 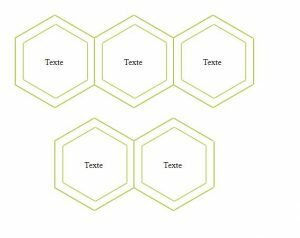 now, we want to extend our hexagons to the edge of the screen, so we need the width of the shortest row and the width of the screen. Now the screen is simple, just get the width of the container element which is 100% width and has all the elements in it. And what about the rows. They also have 100% width and it is used to center the elements. But we were smart and used the “fullWidth” class to get that 100%. So we can just use some jquery magic to remove that class, read the length of the row and then readd the class after. Be warned, this could get a bit heavy on the client navigator if you have too many rows. Et Voila …. 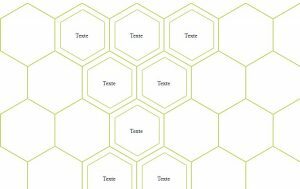 we’ve made hexagons with html and css and a splash of Jquery that fill the screen.